Yesterday I talked about how I am thinking about what makes comics, namely the use of discourse and images. Today, I am talking about a series of books that have no (or hardly any) words in them. 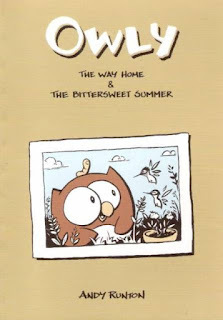 Owly has been coming out since 2004, initially published by Top Shelf but now self-published by its creator Andy Runton. 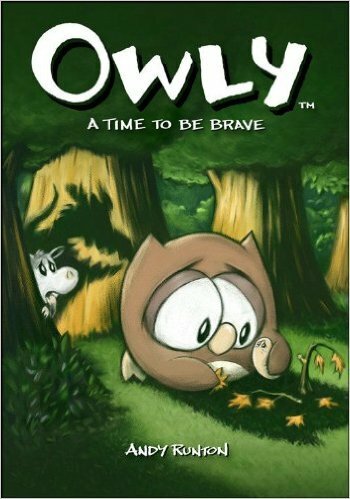 Owly is an adorable owl, and these books chronicle his various adventures in the forest. I have not met a young child who is not instantly rapt by these stories. They are simple, almost intuitive, to read but surprisingly evocative. They are excellent for pre-primer and elementary students, though I have known middle schoolers who also like these tales. In this first volume, there are two stories. In the first, Owly saves a worm during a rainstorm and ends up making a lifelong friend. In the second, Owly and Wormy rescue a caged hummingbird and then have to deal with loss when they learn that they really cannot take care of it and have to let it go back to the wild. 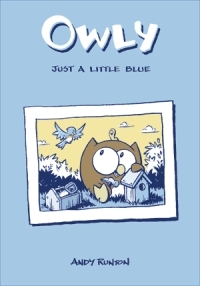 In this book, Owly builds a birdhouse for a pair of ungrateful bluebirds. Over time they start to develop a friendship, but then a bad storm threatens the lives of their newly hatched chicks, and they all learn to work together. 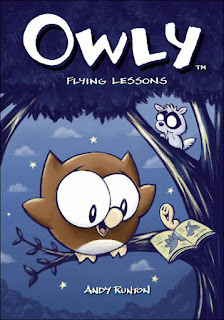 In the third volume Owly meets a flying squirrel, and we learn that Owly is sort of an outcast, because he cannot fly. In a flashback, we see that he had a tough and unhelpful instructor when he was a young owlet at flying camp, and his friends were also all pretty much unsupportive jerks. His new friends band together to help Owly out. In this fourth book, a new creature ventures into this part of the woods. All the forest residents fear this new animal and make up stories about how terrible it must be. Owly finds it in himself to approach it and learn what it is really like. 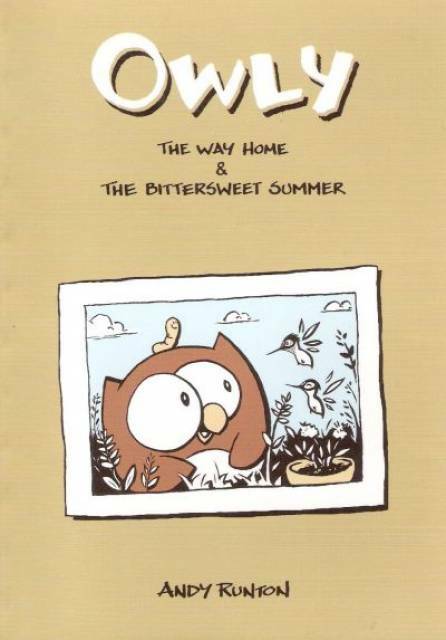 Owly books have won all kinds of awards, including the Harvey and an Eisner. All of the reviews I have read of these books have been positive. Sharon Adarlo called the character and books "very charismatic and kid-friendly." Brigid Alverson praised the "deceptively simple tales of a sweet little owl and his forest friends, told without words but with plenty of emotion and gesture." Hilary Goldstein called Just a Little Blue "a fanciful, magical book deserving of a spot on anyone's bookshelf." 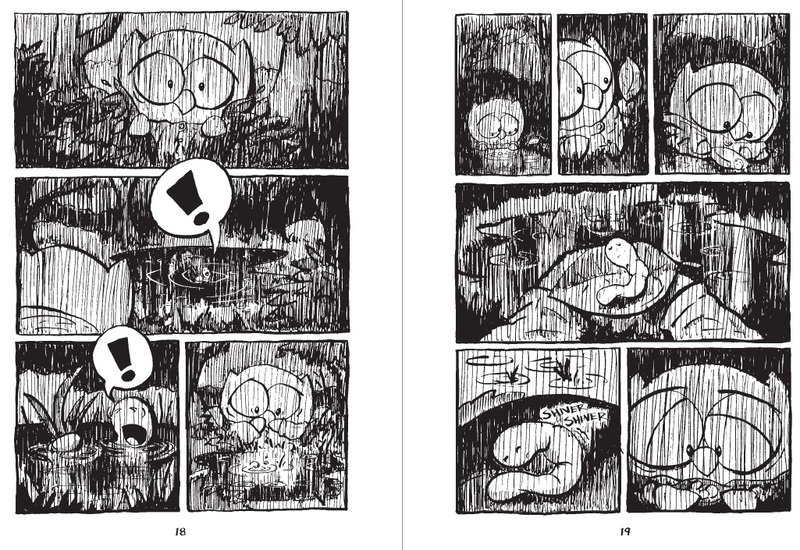 Runton speaks about his inspirations for and work on the Owly books in this interview. 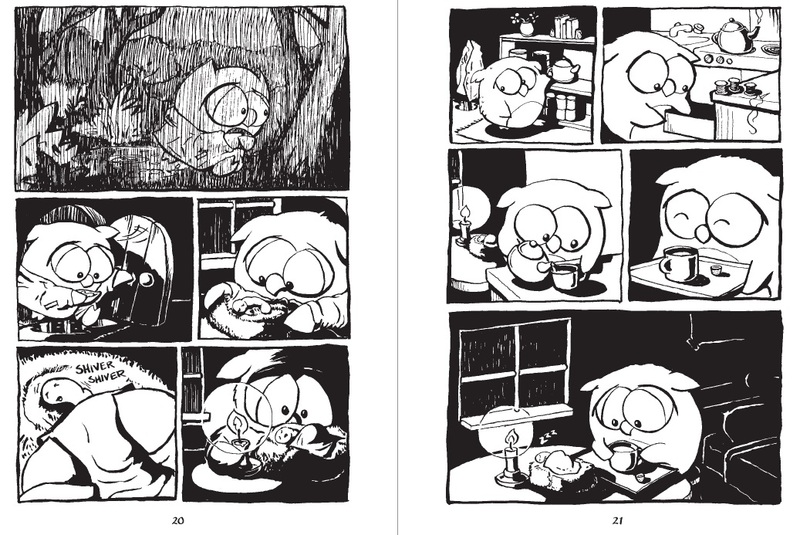 These are only the first four Owly books, and there are more available for preview and sale here. There are also quite a few free Owly comics there to download as well. So instead of just clinging to words, I got thinking about the role of narrative instead. I usually am troubled by just thinking of comics as a storytelling medium, because it can also act like an info-graphic or editorial cartoon, communicating something other than a story. My curiosity lead me to thinking about exposition, and that led me to Wikipedia. According to that grand source, "exposition is one of four rhetorical modes (also known as modes of discourse), along with description, argumentation, and narration, as elucidated by Alexander Bain and John Genung." And so I feel that I hit upon a better way of thinking about the alchemy of comics, what interacts with images to make them work. Poppy! and the Lost Lagoon was an unexpected delight I picked up at HeroesCon this year. 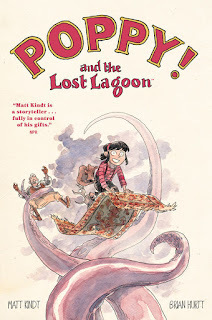 It is an adventure book written by Matt Kindt, one of my favorite contemporary comics creators, with art by Brian Hurtt, who draws The Sixth Gun, a series I should check out because I hear great things about it. Any way, when I saw they had a book aimed at upper elementary/middle school readers, I was excited to check it out. This book has a fantastic set-up. 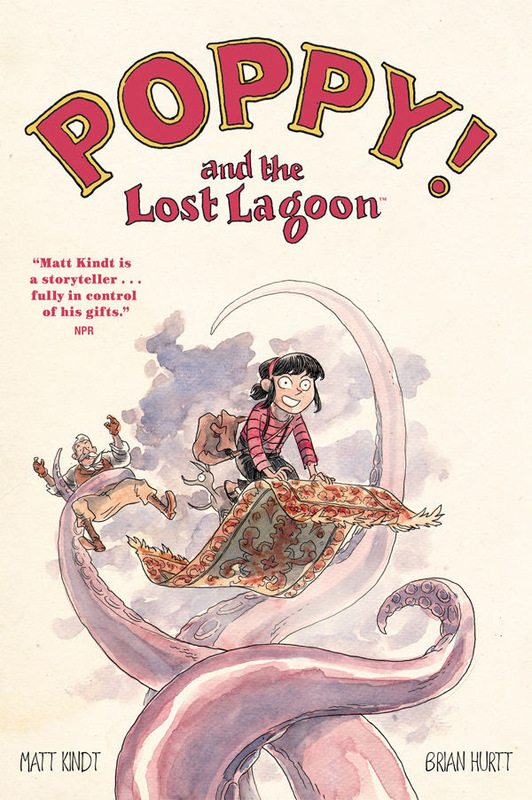 It is about Poppy Pepperington, a young adventurer who is accompanied by Colt Winchester, a gruff old sort who promised Pappy, Poppy's adventurer grandfather, that he would watch after her when he mysteriously disappeared (or died?). This duo meets up with Ramses, a thousands of years old pharaoh who looks like an 8-year old boy and is relegated to a penthouse apartment, who gives them new missions and adventures to undertake. I will not spoil what they do or find on their adventure, but it involves exotic cities, a giant octopus, strange sea creatures, death traps, and fantastic happenings just this side of the supernatural. As you can see from the art and story, there are lots of minute details and intricacies in both the characters and the settings, and they all contribute to a wonderfully vibrant tapestry. The main narrative is nuanced and intriguing, with lots of surprises, twists, and silliness. I had a lot of fun reading this book, and I hope it is just the start to a series, because there is much potential here. This book's creators are veteran comics people. Matt Kindt has created numerous graphic novels, including Super Spy, Red Handed, and Revolver, worked on his own series Mind MGMT and Dept H, as well as having written a good number of titles at Marvel, Valiant, and DC Comics. 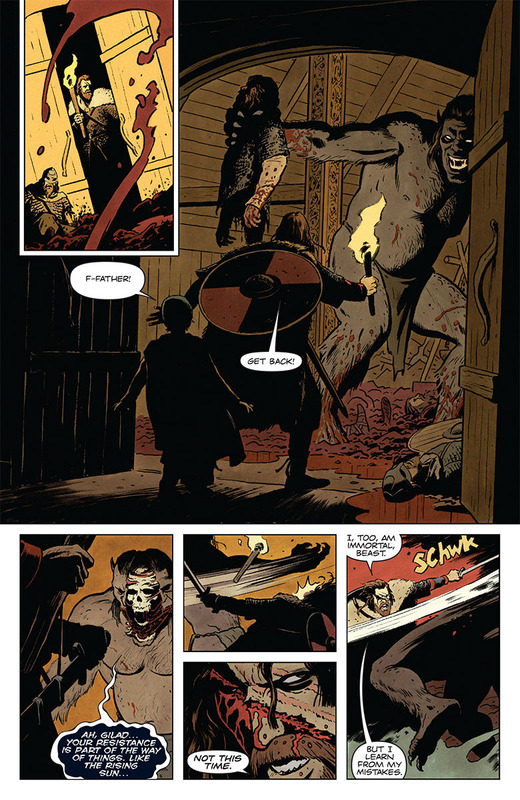 Brian Hurtt is known for his art in genre-bending books like The Sixth Gun and The Damned. 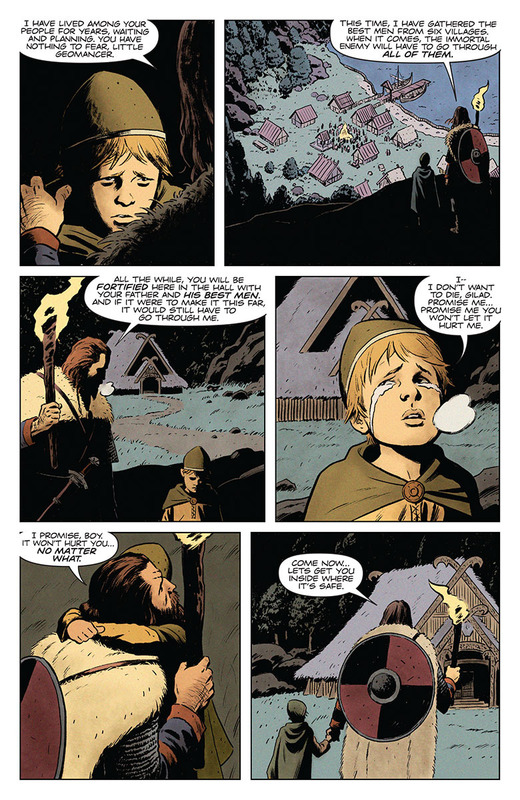 Both Kindt and Hurtt have been nominated for major comics awards multiple times. 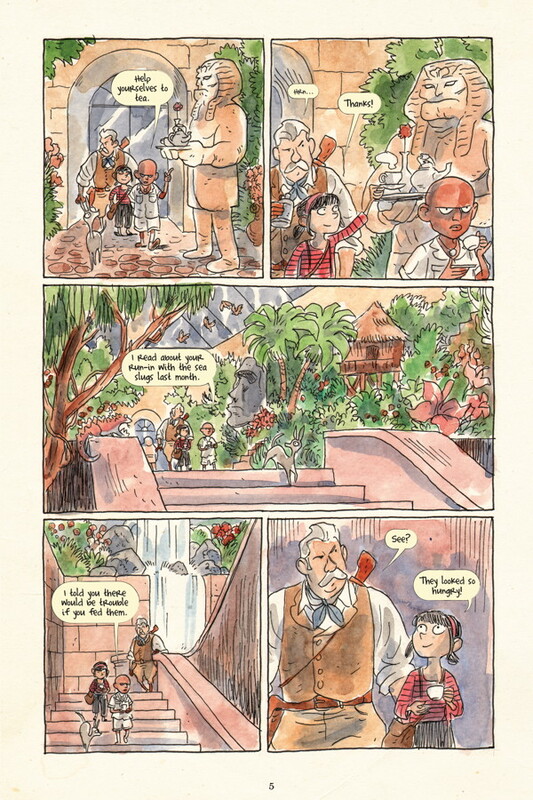 Many of the reviews praise this book as being an American version of Tintin, and I think that is high praise. Matthew Garcia summed it up as "a very enjoyable and lively book." Josh Canales wrote, "This family-friendly book is great for anyone who loves reading." Gwen and Andy at Comics Alternative "could not stop singing [its] praises." Poppy! and the Lost Lagoon was published by Dark Horse, and they have a preview and more available here. I met both Kindt and Hurtt at HeroesCon this year, and they were nice enough to sign my copy of the book. I think it would be fun and interesting for readers young and old, truly an all ages book. Congratulations to the 2016 Eisner Award winners! Yesterday, the Eisner Award winners were announced (the full list is here, courtesy of Tom Spurgeon). Congratulations to all the winners and all those who were nominated, especially my friend Nick Sousanis for his excellent book Unflattening! I have not read a comic book from Valiant since the 1990s. And to be honest I don't think I can tell you much about the ones I did read, other than I remember Bob Layton artwork and Magnus the Robot Fighter. Well, the company is up for pretty much every Harvey Award category this year, a circumstance that some feel is suspicious given their market share size, and this collection of comics was available to borrow from Comixology Unlimited, so I figured why not? Also contributing to my decision was that it was written by Jeff Lemire and Matt Kindt, two prolific and well-respected comics creators whose works I have loved. So, how was it, you ask? I loved it, and I am seriously thinking about following the adventures of some of the major players in this limited series. But I am getting ahead of myself. This collection contains four issues of the series meant to introduce (or reintroduce in my case) readers to the Valiant Universe. It has excellent and brief background on the major players, and although it is technically a crossover, it smartly focuses on a select few. The main plot deals with an ages old character named the Eternal Warrior in his quest to defend the Geomancer, a mystic strongly linked with the Earth, from being murdered by The Immortal Enemy. The rub is that this circumstance has happened three times before, and each time the Warrior has failed and the Earth plunged into a dark age. The intro to the book shows their first encounter/battle. The difference this time is that there are government agencies, not to mention a good number of super-powered beings, that can assist the Eternal Warrior. 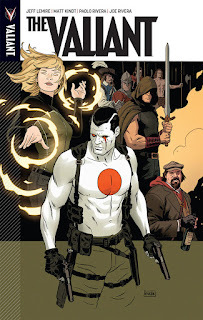 Still the Enemy can use their greatest fears against them all, which makes the central character on the cover, Bloodshot, so important. He is an ex-agent enhanced by nanite technology whose memories have been wiped. He is a killing machine with a healing factor and no fear to exploit, and he is the last line of defense for the Geomancer. I won't spoil things any further, but I will say that I was quickly captivated by the story and artwork. As you can see from the preview, this book melds superhero art and narratives with legends and myths to excellent effect. 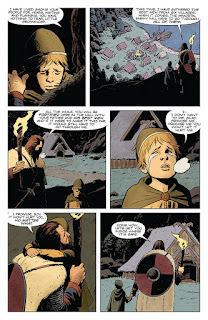 Lemire and Kindt wrote the story here, and Paolo Rivera provided the artwork. Lemire became known for his beautifully spare and brutal Essex County Trilogy as well as work on multiple superhero titles, and his original works The Underwater Welder and Trillium. Kindt also has created numerous graphic novels, including Super Spy, Red Handed, and Revolver, worked on his own series Mind MGMT and Dept H, as well as having written a good number of titles at Marvel and DC Comics. Rivera is a well established comics artist who has mostly done work for Marvel Comics. 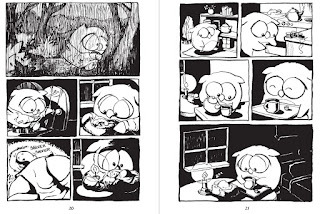 His line work and storytelling are exceptional. Lemire and Kindt speak about their work on The Valiant in this interview. All of the reviews I have read about this collection have been glowing. 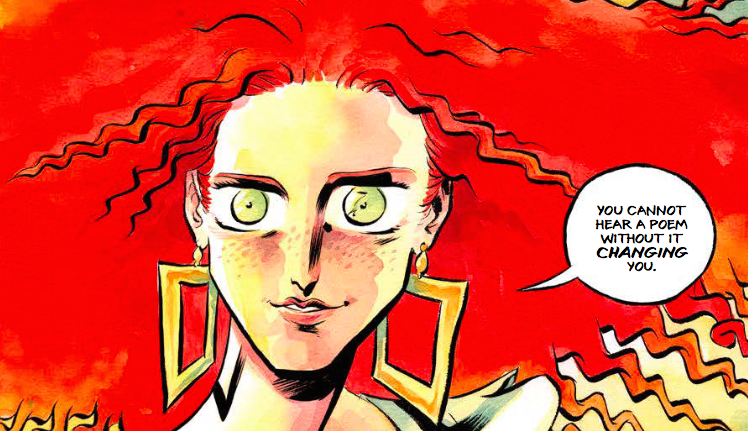 David Harper described it as "one of the better superhero comics in recent years," adding that it was "certainly a comic worth reading for readers both new and old." Publishers Weekly called it "a classic adventure story that hits all the right notes." Jeff Lake praised it as "a fantastic read." 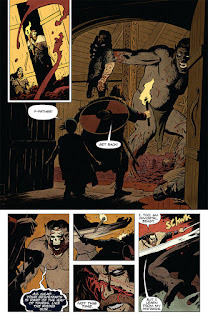 The Valiant was published by Valiant Entertainment, and they have more info about the book here. 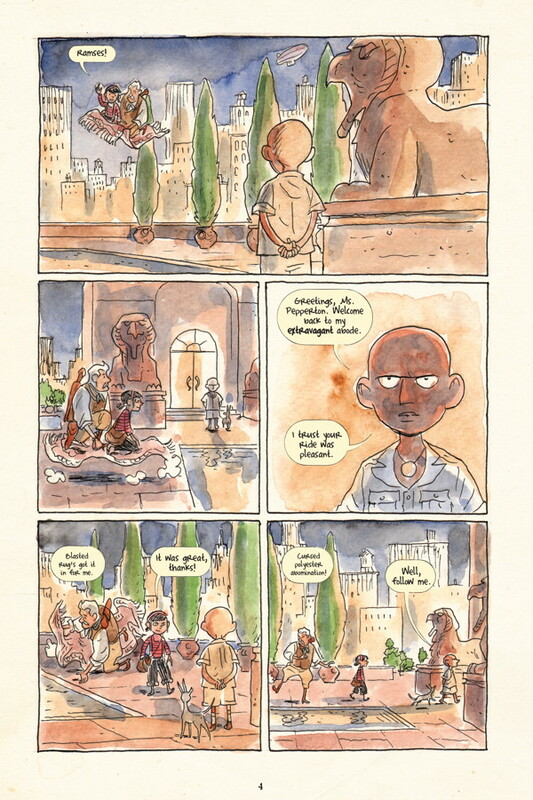 There is a preview available here from Comic Vine, where I copped the three pages above. Every time I go to a conference I have to remind myself not to buy any books, because then I have to carry them home. This year at the International Literacy Association's annual meeting in Boston I was only there for a day, and I was traveling light, but I still ended up buying a few books. 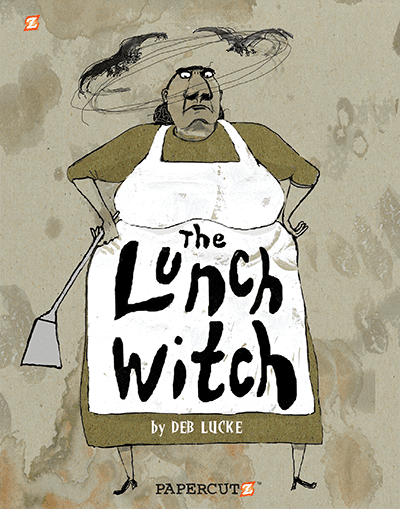 The first one I dove into was this one, The Lunch Witch. Grunhilda is a witch who has fallen on hard times. She comes from a long line of witches who have been renowned for their historically horrible deeds, but times have changed and there is not much call for eating children and causing mass chaos. Also, the market for evil spells and potions has dried up, so she resorts herself to the want ads. Noting her penchant for mixing horrible things together, she eventually becomes a lunch lady. Her life becomes complicated when she meets a girl named Madison who is the only one who seems to realize she is a witch. Madison is struggling in school, and she tries to hire Grunhilda to make her an intelligence potion. Grunhilda struggles with unfamiliar and entirely foreign feelings of niceness and altruism (she is a witch after all), but she does produce that potion for Madison. I won't spoil what happens, but an interloper adjusted the ingredients, and the result of that potion is unexpected to say the least. One of my favorite parts of this book is just how dark it is. The artwork is pleasantly horrific and gray. 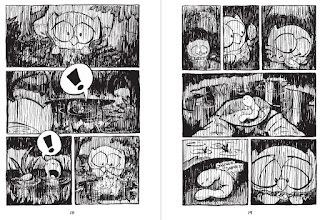 The pages look greasy and strewn with food or other mucky things. But there is joy and heart in these scenarios and characters, and the entire enterprise comes off as highly enjoyable and funny. I read this whole book in one sitting, and I found the whole thing enchanting. This darkly hilarious book was created by Deb Lucke, and it is the first entry in what will be a series I hope. She is a children's book illustrator and this is her first graphic novel. She speaks more about her inspiration and work on this book in this interview. All of the reviews I have read of this book have been full of praise. Publishers Weekly both gave it a starred review, calling it "A wickedly funny start to this series." 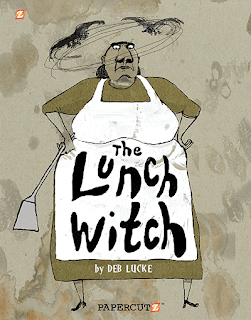 Nate Einhorn wrote, "Like a school lunch, THE LUNCH WITCH doesn’t look like you might expect, but that doesn’t mean it isn’t something to gobble up and enjoy." Esther Keller summed up, "This will be a great addition to any collection. Middle grade readers will devour this title." Papercutz, this book's publisher, provides all kinds of resources and previews here. 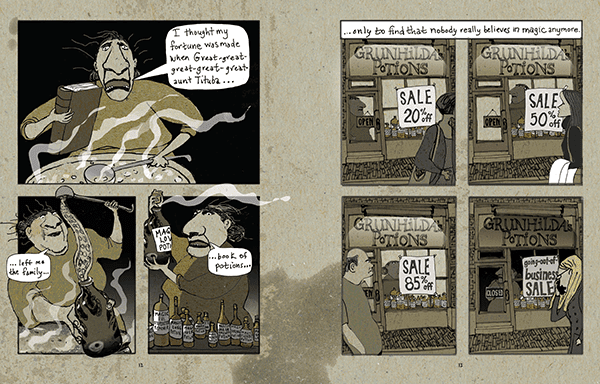 Grunhilda also has her own dedicated website here and it's chock full of fun, I mean awful, things! 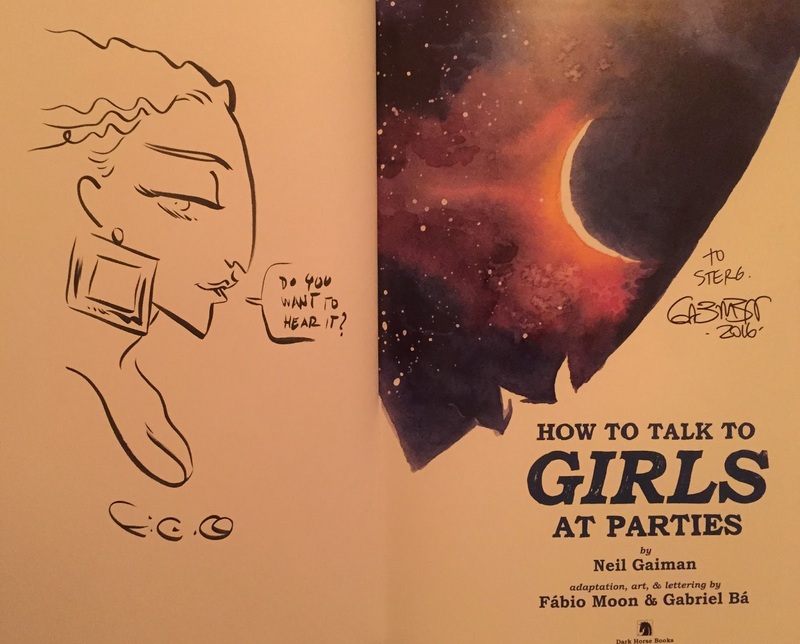 How to Talk to Girls at Parties is not so much the advice book it sounds like. 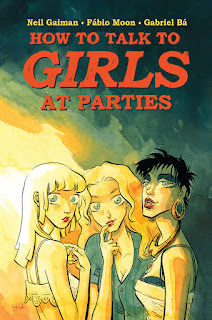 It is an adaptation of a short story about two British adolescents who go searching for a party so they can talk to girls. Our narrator, Enn, is relatively shy and inexperienced, and he has a difficult time working up the confidence or words to speak to girls. Vic, on the other hand, is a smooth operator who ingratiates himself with his charms with pretty much anyone instantly. The story this book is based on was nominated for a Hugo Award in 2007, written by Neil Gaiman, one of the most celebrated fantasy writers of the past two decades. 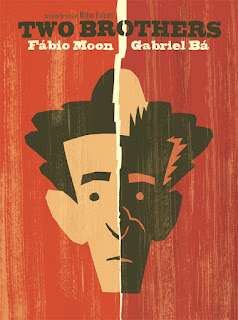 It was illustrated by Fábio Moon and Gabriel Bá, two of the most celebrated comics artists of the past decade. This book might not contain the most deep or impactful story ever told, but it is extremely well executed and beautiful to behold. All of the reviews I have read about this book have been full of praise, some glowing. 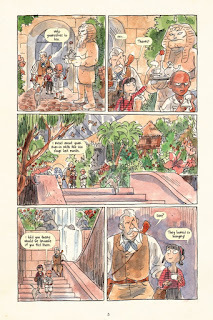 Johanna Draper Carlson wrote that this adaptation got many things right and added, "It’s interesting to see how brothers Moon and Bá interpreted the descriptive elements, and their work is attractive, potentially bringing the work to a different audience." Chad Waller, a huge Neil Gaiman fan, already loved the story but added that the "artwork is fun, charming, and fits the story perfectly." Gary Makries wrote, "I was moved by the passion from not only the wordsmith. but also from the crafting of panel after panel that felt delicate, graceful, and powerful all at once." 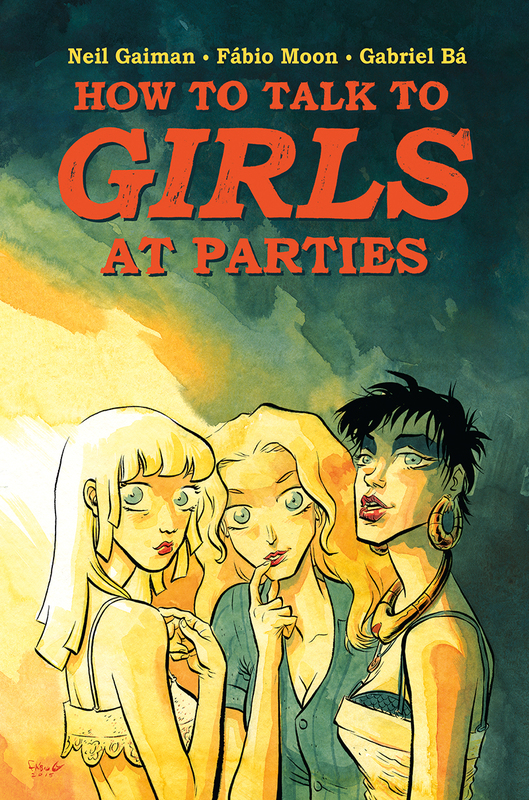 How to Talk to Girls at Parties was published by Dark Horse, and they offer a preview and more info about the book here. There is a video trailer for the book here. Like I wrote in my last post, I got to meet the artists at this year's HeroesCon. They also signed and doodled in my copy of this book. Thank you to a couple of warm, excellent, and funny creators! The most complex and moving stories can be spun from the simplest of things. Take for example, this book Two Brothers, which is based on the writings of Milton Hatoum, one of Brazil's greatest authors. This graphic novel follows a family over the course of a number of decades, with its many relationships, twists of fate, secrets, and reverberating decisions. Much of what transpires flows from the relationship of two brothers, Yaqub and Omar, who look identical but are very, very different. Yaqub us sent away to be raised in Lebanon at a young age while Omar stays at home in Brazil and becomes a ne'er-do-well who drinks and carouses much of the time. Yaqub eventually returns a changed man, a learned one, too. Coming back raises many issues long thought buried, and the past once again haunts the present. 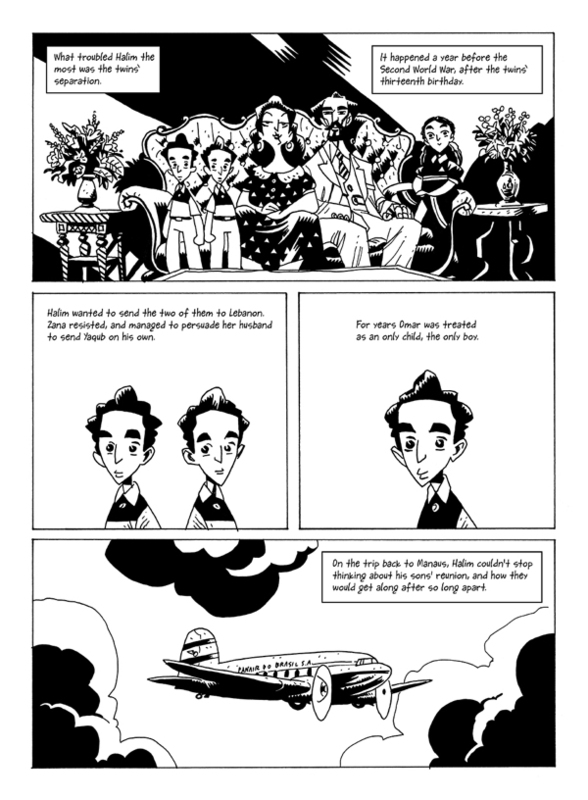 Still, Jaqub becomes a notable engineer and moves to Sao Paulo, though his presence is still felt by the whole family. Sorry for the info-dump about the plot set-up, but it is all prologue to my saying that this book has something for pretty much everyone: family drama, romance, secret affairs, illegitimate children, run-ins with criminals and con-men, revenge, and lots of people seeking recompense for what has happened in the past. Apart from the plot, the artwork, rendered in black and white, is also exquisite, full of energy, emotion, and detail. I was moved several times while reading this book, and once I started I really did not want to stop. Also, it is so beautifully crafted and full of nuance that I immediately sought to reread and revisit it. This is a sumptuous, deeply satisfying sort of book. 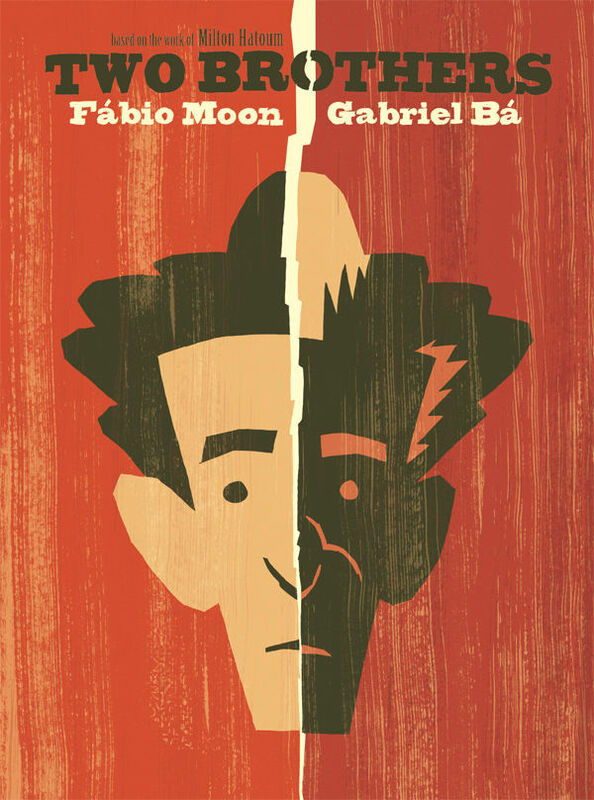 Fittingly, this book's creators, Fábio Moon and Gabriel Bá are twin brothers who have been making comics together since childhood. Moon is probably best known for his collaboration with writer Matt Fraction, Casanova, a science fiction spy story, and his Eisner Award winning webcomic Sugarshock. Bá also collaborated on Casanova and is well known for drawing The Umbrella Academy, a celebrated tale of super-powered siblings written by rocker Gerard Way. 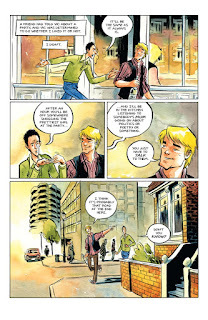 The brothers collectively blog about their works here, and they have created a number of works jointly, including the multiple-award winning Daytripper and an adaptation of Neil Gaiman's short story "How to Talk to Girls at Parties." They speak extensively about their work on Two Bothers in this interview. All of the reviews I have read about this book mentioned how excellent it is and also how it enhances its already rich source material. Jesse Schedeen remarked on how it "weaves a complex, multi-generational tale of a family torn apart by a feud" and "features both artists working in perfect storytelling sync." 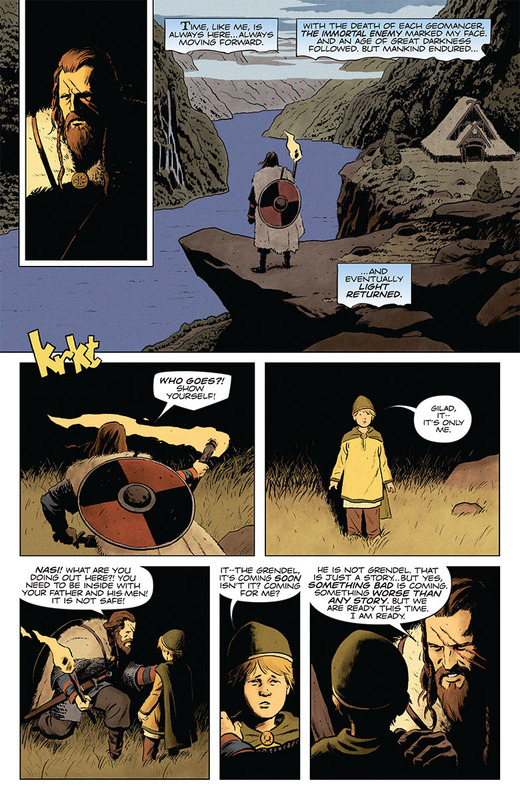 Matt Little praised it as "a work of art that shows the power of sequential storytelling and its ability to enhance and enrich an already captivating story through mis en scene and confident artwork." 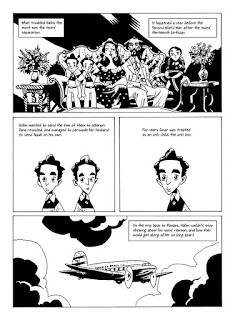 Oliver Sava wrote, "Moon and Bá’s talent for dramatic composition and nuanced emotion allows them to realize the full scope of Hatoum’s novel while interpreting it through their own distinct artistic sensibility, giving readers a deeply poignant story that is elevated by the phenomenal visuals." Two Brothers was published by Dark Horse, and they have more info about the book here. I just met the two authors at HeroesCon this year, and they were nice enough to autograph and doodle in my copy of this book. It was a great thrill to meet them!